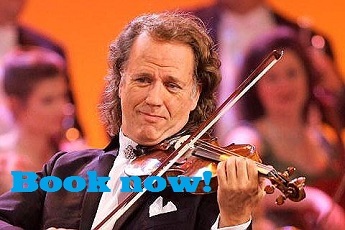 André Rieu fans might want to check their nearest cinema complex. The news is that Rieu’s upcoming Maastricht concert will be broadcast via satellite to cinemas worldwide on Saturday June 30th 2012. The 2012 Maastricht event marks the 25th anniversary of André and his Johann Strauss Orchestra performing together and is planned to be the most spectacular of the annual shows in Rieu’s hometown. The orchestra will notably be joined by the 150-piece Royal Choir Society Maastrichter Staar. “It fills me with great joy to be able to share my hometown concert in Maastricht with all of my friends in Europe. It is going to be a magical & special evening, celebrating 25 years of performing with my fantastic Johann Strauss Orchestra, with lots of highlights from the past 25 years! Come and enjoy the music on the big screen in the comfort of your local cinema.” says Rieu. Who saw the André Rieu show? I just read that it was broadcast to 60 cinemas in Canada.